Those up to date in the global shred scene in the past five to seven years have probably heard of Mr. Fastfinger, guitar sensei extraordinaire. He has garnered a good amount of recognition with his internet guitar lessons and the assorted shenanigans spread around them on the man’s website. Along with the instructional material, he first collaborated with his Finnish songwriting partner Mika Tyyskä in 2009 to create his debut album, The Way of the Exploding Guitar. Now the same team, backed with a support crew and special guests like Dream Theater’s Jordan Rudess, have come out with the teacher’s second album, In Motion. Musically, we’ve got quite the versatile offering at hand. As the maestro’s website puts it, The careful selection of glorious musical themes alternates with very intense, fast and emotional guitar solos, very loud riffs with tribal percussion, ambient keyboards and an amount of exotic instruments unmatched in the instrumental rock genre. I’m not completely sure about the “unmatched” and such but it can’t be denied that this is a very skillfully assembled package. Tight playing all around with Fastfinger and his guesting students providing plenty of air guitar fodder with their solos. In the tunes, we’ve got speedy rock n' rollers like Super Sinister and Mountain Mover, a more metallic stomper in Daemons & Ghouls, some relaxed Satriani-style grooving with Beach Turtles and mellow, soothing pieces like Breathe. A few songs, like Motion Beat, may go a bit far with the quirkiness. The song previously mentioned features some odd half-spoken grunts along with the midi-style beats that kinda mesh together but not brilliantly well. If the overall vibe is supposed to be humorous, eeeh a valiant effort but my chuckle senses were left numb. 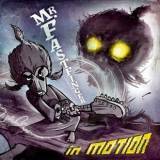 If anything, Mr. Fastfinger’s In Motion suffers from the same condition so many instrumental albums are stricken with. It’s extremely proficient technically and many songs have cool sections or riffs or solos here and there but…you get the idea. None of them really stand out as the absolute highlight of the album. The package as a whole is left plain. Nothing is absolutely memorable, not even the stellar playing chops. I do believe that this record should please all the guitar freaks and obscurity lovers. Too bad that the gap beyond that niche audience will probably be too large for wider recognition through records like these.